As you know from our previous blog articles we're big fans of the Dremel Rotary Tool and all that comes with it and attaches to it. 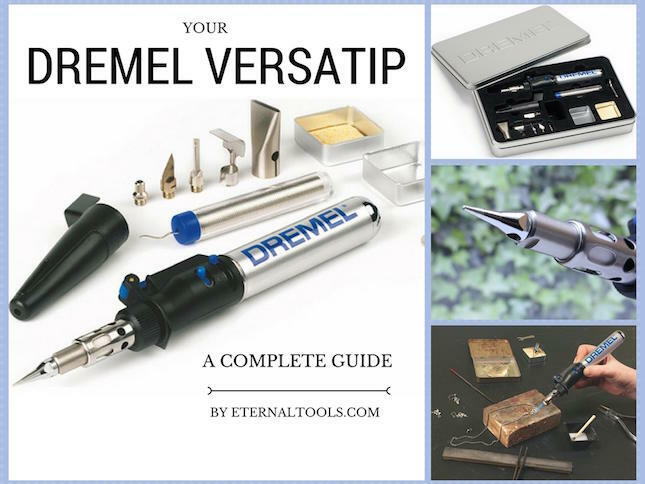 Well, this article is a review and guide to the Dremel VersaTip 2000-6 kit, an all in one gas torch, soldering iron, pyrography pen and more, that comes with 6 attachments tips. Also included are a soldering tin and sponge, sponge box tin, which is handy for putting the hot tips in when changing heads or putting solder into. There are also a 7mm and 8mm spanner, or wrenches, for changing and tightening the tips and some tin electrical solder. Begin by removing the soldering tip. At the end, you have the catalyst. This heats up, and this is where you screw the different tips into. The flame guard is the silver part covering the ceramic insulator and this is where the flame comes from. The Flame guard gets very hot, so be careful. 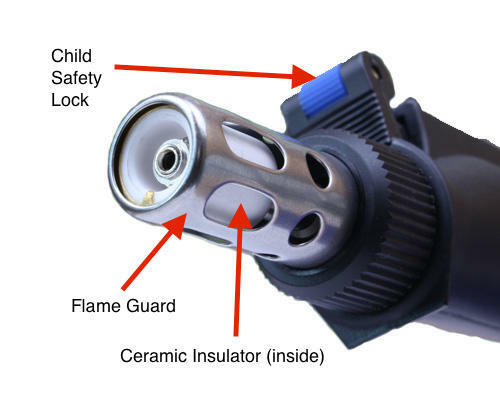 There is a child safety lock which is attached to the trigger, as well as a switch for continuous use, a flame control knob, and the fuel tank, and at the end of the fuel tank, you have the filling valve. To fill the tank, hold it vertical, turned off obviously, and away from any naked flames. Use standard butane gas or lighter fluid as it is sometimes referred to, and press down firmly. It only takes a few seconds. When gas starts to erupt from the top, it is full. With a full tank of gas the Versatip will burn for up to 45 to 90 minutes, depending on the flame size and how you are using it, super economical! To use the Versatip as a torch, or an open flame, you first need to remove the catalyst on the end. 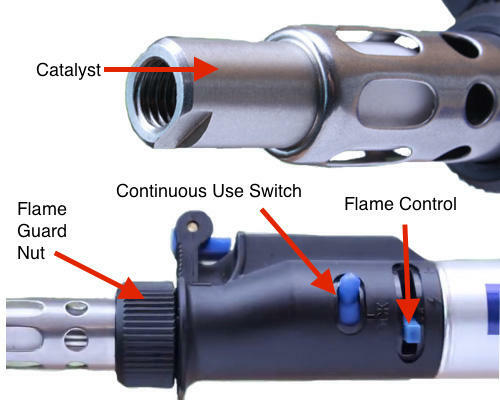 To do this, unscrew the flame guard and the catalyst comes out. Put the flame guard back on and ignite it by pushing forward with your thumb on the child lock, then pull back the trigger. Release the trigger and the flame will extinguish. How to Keep the Torch on a Continuus Flame and How to Control the Flame Size. When the flame is on, move the lock switch to keep it on. Here you can also control the size of the flame. The smallest flame size is great for use with the hot knives and the various heating tips, also ideal for fine detail, but perfectly big enough for larger items like rings and bracelets. Set the torch to a medium size flame and ignite it, it will take just a few seconds to heat up. Touch the solder to it and when it melts, you know it is ready to use. A medium flame is great for soldering jewellery when using silver and gold solder. Don't use the electrical tin solder supplied in the tin on any precious metals. The solder supplied is just for electrical work. Use the Versatip Soldering iron as you would any electrical soldering iron, for connecting wires and small electrical components. Versatip doesn't need electricity though, so it's perfect for DIY jobs when the electric is turned off. Apply a drop of water on the sponge and use this for cleaning the tip when you're finished. Helpful Tip: You can stand the torch up if you want to use it hands-free. To leave a neat and safe joint when doing an electrical job use the hot blower head to heat-shrink the tubing. Use on its own for a gentle heating of plastic and shrink wraps, or you can also use the reflector, which helps to deflect the heat around both sides of the wire. 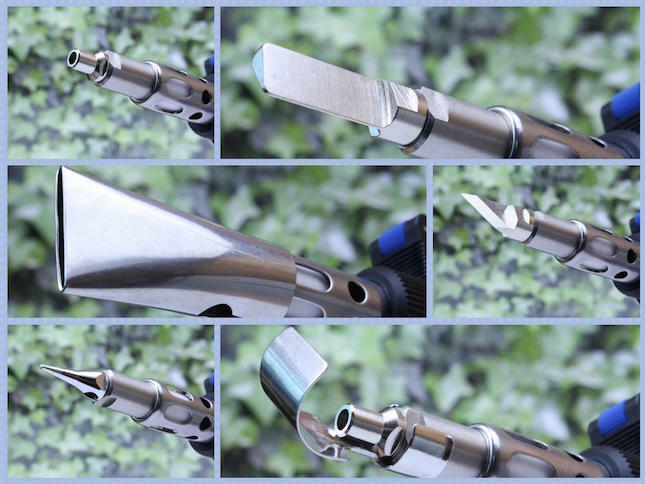 The hot cutting knife is fantastic for cutting nylon rope, plastic sheets, cord, laces or webbing straps. It melts the material and stops the ends from fraying. The shaping hot knife gives a wedge-shaped tool, a larger tip for working with plastics, nylon ropes, and generally anything that you need to apply a little bit of heat to. It goes without saying that after you've been using your Dremel Versatip, the tips and the flame guard can still be very hot for several minutes afterwards so please be careful. Avoid putting the plastic cap back on until the Versatip has completely cooled down. Portable - take it anywhere!